This memorial is dedicated to the memory and honor of those who have served bravely in our Armed Forces in both times of war and in times of peace. 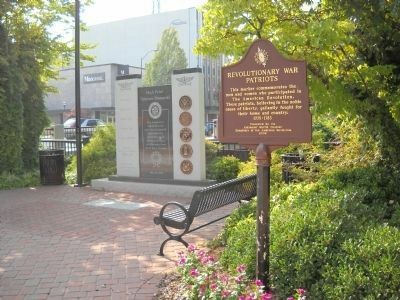 Erected 2005 by City of High Point, NC. Location. 35° 57.463′ N, 80° 0.319′ W. Marker is in High Point, North Carolina, in Guilford County. Marker is at the intersection of S Main Street (U.S. 311) and E High Avenue, on the right when traveling north on S Main Street. Touch for map. Marker is in this post office area: High Point NC 27265, United States of America. Touch for directions. Marker is located near the Knox Bridge over the railroad tracks. (within shouting distance of this marker); Camp Fisher (approx. 0.2 miles away); Guilford Technical Community College (approx. half a mile away); Confederate Soldiers Monument (approx. half a mile away). Touch for a list and map of all markers in High Point. More about this marker. 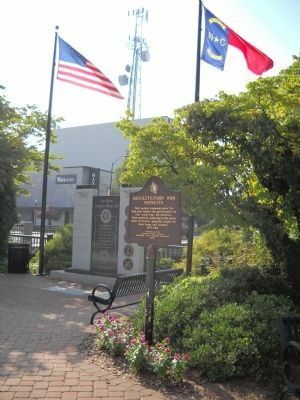 The seal of the City of High Point, NC appears at the top of the monument. The right side of the monument contains the logos of the United States Army, Navy, Marine Corps, Air Force and Coast Guard. More. 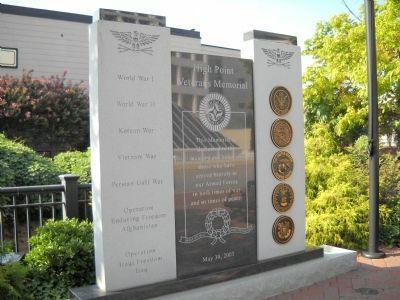 Search the internet for High Point Veterans Memorial. Credits. This page was last revised on June 16, 2016. This page originally submitted on September 16, 2010, by Bill Coughlin of North Arlington, New Jersey. This page has been viewed 1,605 times since then and 8 times this year. Photos: 1, 2, 3. submitted on September 16, 2010, by Bill Coughlin of North Arlington, New Jersey.